Airspy HF+ is one of the best SDR receivers in the market. A paradigm shift in high performance HF radio design. It is a joint effort between Airspy, Itead Studio and some famous chip maker to build a state of the art SDR for HF and VHF bands. The receiver operates from 9 kHz to 31 MHz and from 60 to 260 MHz. The new design is based on a "Zero-IF" concept, whereby the received signal is mixed directly into the baseband range. This technology avoids many of the problems of classic receiver designs, but also presents developers with new challenges. The Airspy HF+ meets these challenges by using three analog tuners with fixed and tunable band filters. The mixers are designed as harmonic rejection mixers and thus ensure an extraordinarily good linearity and spectral purity of the down-mixed signal. This is important for a good sensitivity, because the cleaner the signal, the less likely it is that a weak signal will be lost in the noise. Two very capable AD-converters are used for digitizing the baseband signal. The subsequent decimation stages (DDC) work with different methods for reducing (decimating) the data rate. The result is a very effective anti-aliasing filter that provides approximately 108 dBc reduction. The resulting signal has a resolution of 18 bits, which is then scaled to 16 bits for transmission via the USB 2 interface. The Software Defined Radio revolution brought great flexibility in VHF and UHF reception. Today we offer the best wide band receivers which address these needs. We also provide a high performance extension for weak-signal wide band reception on HF – something other competing solutions fail to address efficiently. Airspy HF+ is a paradigm shift in high performance HF radio design. It is a joint effort between Airspy, Itead Studio and ST Microelectronics to build a state of the art SDR for HF and FM bands. Like most high-end HF receivers, the HF+ uses very high dynamic range ADC’s and front-ends. But unlike the current offerings in the market, it also brings more frequency agility by using high performance passive mixers with an excellent polyphase harmonic rejection structure. With its best in class strong signal handling capability, the HF+ is the ideal companion for light portable high performance operation. Both the architecture and level of integration achieved in this design allow us to bring top performance reception at a very affordable price. All the major SDR software is supported. Check the download page. We spent a lot of time understanding RF noise, its structure, and how it interacts with legitimate signals. Today, we have one of the most flexible and acoustically pleasant noise reduction algorithms of the market. The applications range from high-fidelity hiss removal for Broadcast FM signals, to unburying weak SSB signals from the noise floor. Our algorithm doesn’t kill the highs to give you a false impression of loudness, yet it doesn’t have the typical high tone artifacts that plague popular noise reduction algorithms like LMS and Spectral Subtraction. State of the Art SDR streaming technology! We concentrated state of the art DSP and networking techniques into our SpyServer software to allow multiple users to stream high quality IQ data from the same receiver at the same time. No compromises in the quality were made like it is usually done in Web SDR interfaces. You get actual IQ data you can process with your plugins and extract the last bit of information out of it. The server software is highly scalable and can run on computers as small as the $7 Orange Pi Zero to top end 64bit servers with multiple cores/cpus, including the popular Raspberry Pi series. 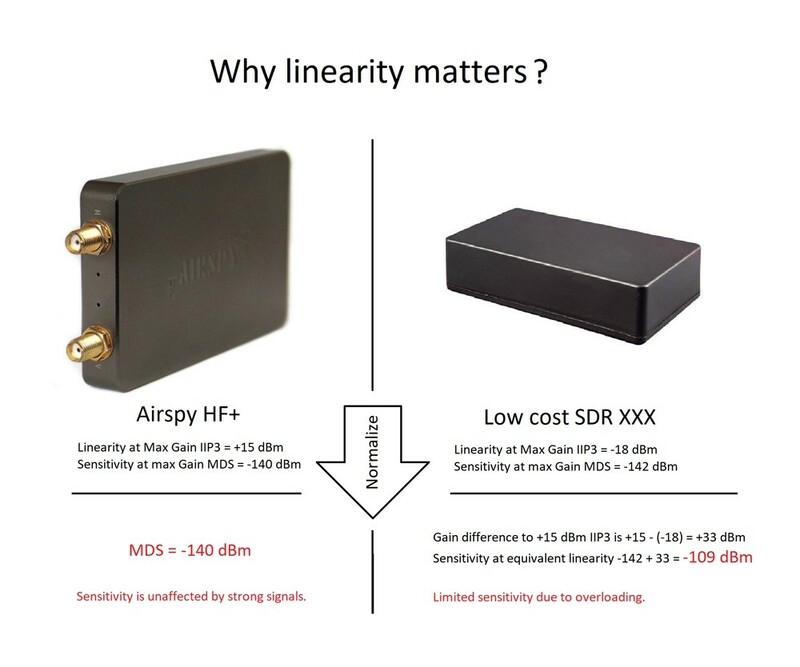 Airspy HF+ achieves excellent HF performance by means of a low-loss preselection filter, high linearity LNA, high linearity tunable RF filter, a polyphase harmonic rejection (HR) mixer that rejects up to the 21st harmonic and multi-stage analog and digital IF filtering. The 6 dB-stepped AGC gain is fully controlled by the software running in the DSP which optimizes the gain distribution in real time for optimal sensitivity and linearity. Harmonic rejection is a key issue in wide band HF receivers because of the large input signal bandwidth of the input signal. The output of the IF-filter is then digitalized by a high dynamic range sigma delta IF ADC for further signal processing in the digital domain. Excellent FM performance is also achieved by using optimized signal paths composed of band filters, high linearity LNAs with a stepped AGC, a polyphase harmonic rejection mixer and IF filters optimized for the FM broadcast bands. The amplifier gain is switchable in 3 dB-steps and fully controlled by the AGC running in the DSP. The RF signal is converted to baseband by a high linearity passive mixer with a polyphase harmonic rejection structure. The low-IF signal is then converted into the digital domain by the same IF ADC used in the HF chain. Extended VHF coverage is assured by a second Band-III tuner up to 260 MHz, but with reduced performance. The IF analog to digital converter (ADC) is a 4th order multi-bit noise shaping topology; it features very high dynamic range and linearity. The IF-ADC sampling rate is determined by a control algorithm running in the embedded DSP. This advanced technique adjusts the sampling rate depending on the tuning frequency with the goal of avoiding the disturbances and spurs generated by the switching discrete-time sections of the IF-ADC. Once the IF signal is digitalized, the high sample rate I/Q stream is then frequency translated and processed with cascaded CIC and FIR decimation stages. After every stage, the sample rate is reduced and the resolution increased. The final signal at the output has 18bit resolution and an alias rejection performance of 108 dBc. The data is then scaled to 16bit and sent to the Micro-Controller for streaming over USB. The main advantages over techniques from the legacy super-heterodynes up to the now mainstream direct sampling is that the whole receiver chain is well protected against out of band blockers while still relaxing the RF filtering constraints, making it simple and cost effective. The natural filtering of the sigma-delta ADC combined with the excellent linearity and sensitivity of the analog chain reaches an unprecedented level of performance and integration. Use it over the network! Connect as many SDR applications as needed to the HF+, over the Internet or in your own local network with near zero latency thanks to the new SPY Server software. 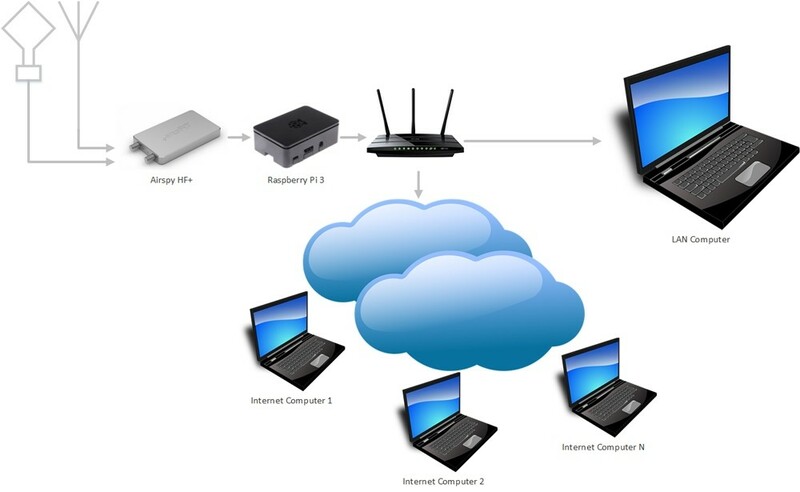 This setup basically brings all the flexibility of Web based SDRs while still benefiting from the full power of desktop applications. The IQ data is processed in the server with state of the art DSP and only the required chunk of spectrum is sent over the network. What is sent is the actual IQ signal, not compressed audio. This means you can use all your favorite plugins to process the IF, eliminate noise and perform heavy lifting of the signals as you are used to do with locally connected SDR’s. We have a tradition of building multi-tools, so we made sure the SPY Server runs on 32/64bit Windows and Linux on Intel and ARM processors without any compromises. Low cost Raspberry Pi 3 and Odroid boards are in the party. The HF input port is optimized for the HAM bands higher than 300kHz – A simple modification for VLF is possible by shunting an input capacitor. While the in-band performance of the Band-III tuner is excellent, it will require some filtering for very strong out of band signals at multiples of the tuned frequency. An RF isolator is required when using long wire antennas with a PC with moderate EMI protection.